Started all 24 matches, scoring five goals and notching six assists for a career-high 16 points … Finished third on the team in goals, tied for second in assists, and second in points … Totaled 44 shots, 18 on target for a .409 shot on goal percentage … The shot total was the third highest on the team and shots on goal were fourth highest … Scored goals against No. 1 Penn State (Aug. 25), at Providence (Sept. 10), at Auburn (Oct. 5) and at NC State (Nov. 11) in the NCAA Tournament First Round … Tied a career high with two goals scored at Providence … Notched a career-high two assists in the 6-1 win over Abilene Christian (Aug. 27), both coming on goals by Parker Goins … Played 90 or more minutes 12 times during the season, including a career-high 110 minutes in a scoreless tie at Vanderbilt (Sept. 21) … Scored Arkansas’ only goal in the NCAA Tournament match at NC State, scoring on a fast break near the right post in the 81st minute … Named to SEC Fall Academic Honor Roll. Appeared in 24 games with 23 starts … Collected six goals, three assists, 15 points and one game-winner during her first season as a Razorback … Ranked fifth overall in the SEC in shots (68) … Recorded 68 shots with 34 on goal for a .500 shots on goal percentage … Placed sixth on the team in points (15), fifth in goals (6), fourth in assists (3), first in shots (68) and shots on goal (34) and sixth in game-winning goals (1) … Selected into SEC All-Conference Freshman Team … Scored in three consecutive games (James Madison, VCU, UMKC) to start the season … Named ‘SEC Offensive Player of the Week’ on Aug. 29, 2016 for her game-winning goal against then-No. 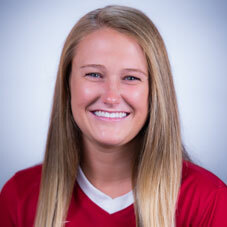 2 Duke (Aug. 26) at Razorback Field for Arkansas’ first win against a top-10 program in school history … Selected as ‘SEC Freshman of the Week’ on Aug. 22, 2016 for scoring three goals during her first two games as a Razorback on the road against James Madison (Aug. 19) and VCU (Aug. 21) … Ranked No. 14 on TopDrawerSoccer.com’s ‘Women’s Freshmen Top 100’ list … Selected into SEC All-Conference Freshman Team and the NSCAA All-South Region Third Team.